The heart of our monitored CCTV system comprises of a TeleEye DVR unit complemented by a set number of cameras and detectors. When activated, the detectors send a signal back to your on site TeleEye saying there is movement on site which then, in turn, connects directly (i.e. not an email alarm) to our Central Monitoring Station for our operators to act on. 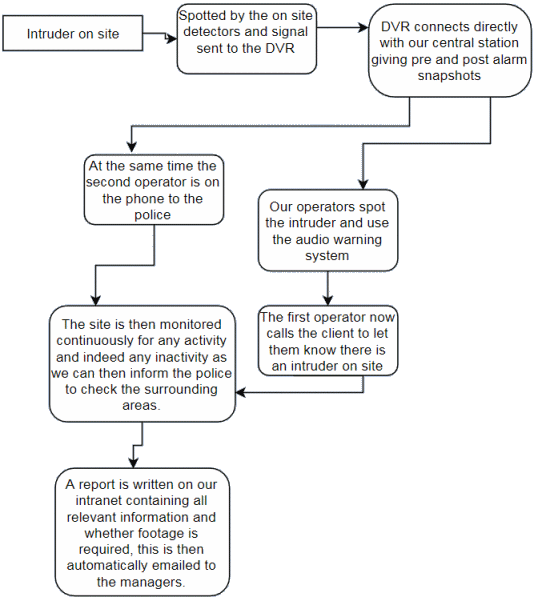 Upon visual verification of an intruder we then use the live audio announcement on site to make the intruders aware they are being watched and then alert the police and key holders. We do not charge extra for bank holidays, Christmas or Easter shutdowns or any unforeseen closures where the site will be vacated. We will monitor your site for as long as you need us to!